Marty Zwieg (may he rest in peace) said "don't fight the fed. and don't fight the tape." It is hard to buy into a hot market, but when you need income you have to deploy capital. I am hoping Marty was right. I am not going to fight the tape with two ideas for today. Both of these stocks have pristine balance sheets. A solid balance sheet does not mean a stock's price will not go down but it does go a long way toward making sure the company can continue to pay the dividend and that the company will not go down. Every income investor needs to be confident that dividends will continue and hopefully increase. We need to protect our principal since most of us are not working any more and depend on our money at work. Covered call opportunities are icing on the cake for income investors. Let's look at the fundamentals of the two stock ideas for today: CVX and INTC. 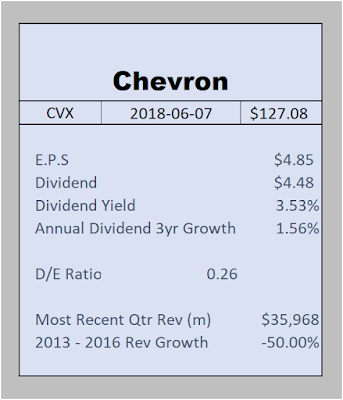 Chevron has been through a very rough patch. Between the years 2014 and 2016 their revenue was cut in half. The stock price suffered and earnings were less than dividends paid out for a while. But things have turned around with the increase in oil prices. During the bad years, CVX, increased the dividend but not by much. Their average dividend increase over the three year period of May, 2015 through May, 2018 was only 1.55%. This too has changed. 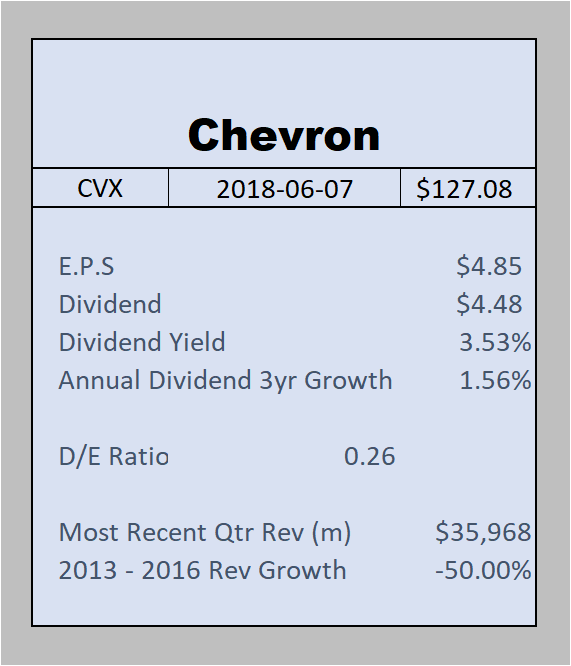 CVX's most recent dividend increase was 3.7%. I really like a 4% dividend increase but 3.7% is o.k. Since CVX has a yield of 3.53%, it beats any U.S. treasury available today. The table below presents the fundamentals I use to evaluate my income stocks. In summary, CVX has a good balance sheet, increasing revenues, earnings per share greater than dividends paid out and a growing dividend. These are good fundamentals. 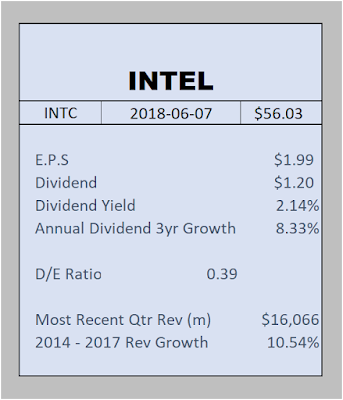 Intel is a totally different stock than CVX. What they have in common is the solid balance sheet, growing revenues and growing dividends. 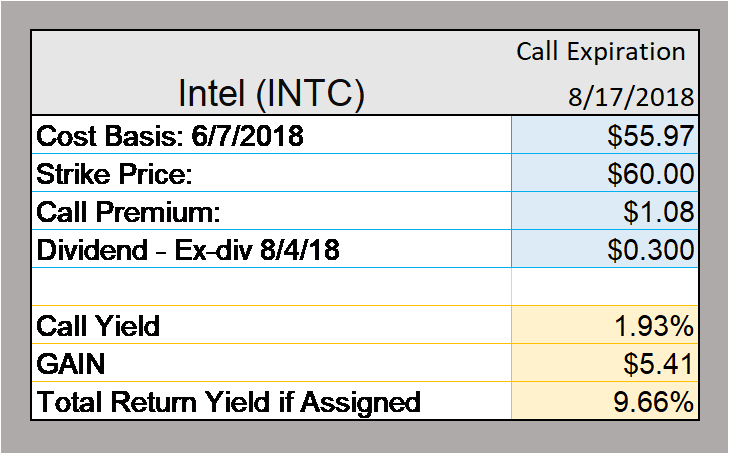 Take a look at INTC's fundamentals presented in the table below. Both stocks carry a current P/E (price earnings) ratio in the mid 20's. Both companies have enough earnings growth that their forward P/E's are expected to be in the mid teens. This is somewhat comforting as we don't like to buy stocks that are too expensive during times when we try to not "fight the tape." CVX is more vulnerable to price fluctuations than INTC because CVX is dependent on the price of oil whereas INTC is not dependent on any one factor. Technology will continue to develop and I believe Intel will not be left behind. Both of these stocks have calls that are intriguing. Remember with calls you risk limiting your upside potential. Therefore, you may want to sell calls on only part of your position. If you are like me and feel there is always another stock to buy if you lose your shares in either stock, then you can make this a short term income trade. 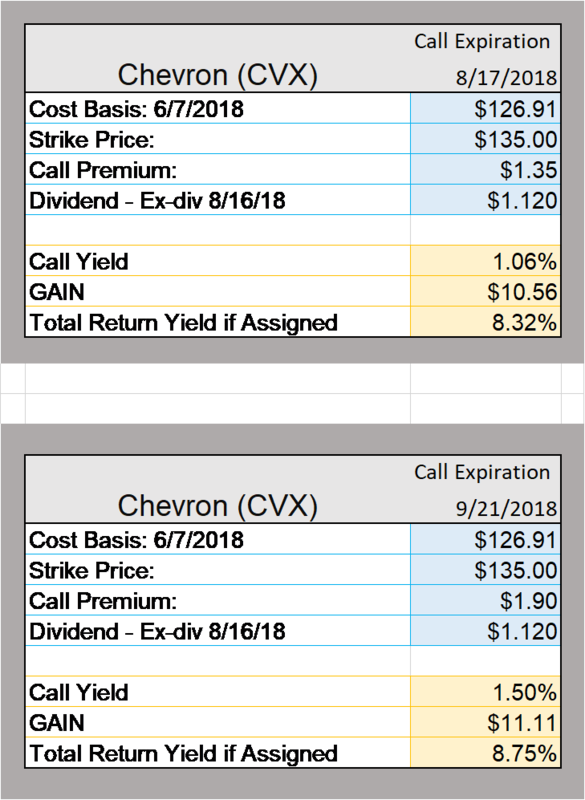 I found two calls I like on CVX. One expires in August and pays you 1% yield on the strike price of $135. However, the ex-dividend date is just one day before the call expires and the call buyer could exercise the call just before the ex-dividend date and you get only the 1% premium plus the capital gain. 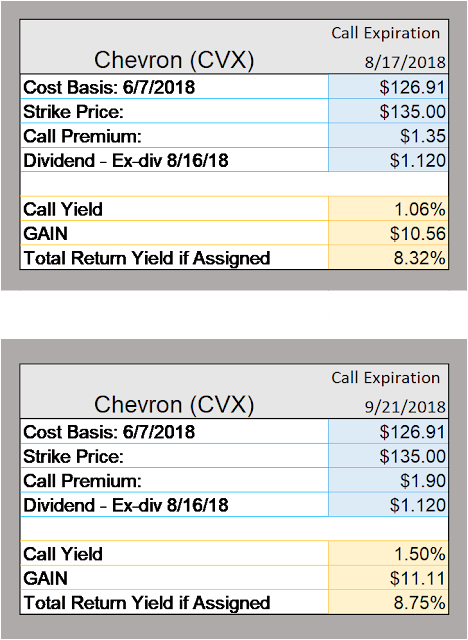 In the second call, you have to wait until September for the call to expire but you get a 1.5% yield from the call premium and most likely will receive the dividend as well. If exercised, you will receive the same capital gain. The Intel call is more straight forward. I selected an August 17, 2018 expiration date with a strike price of $60. The premium on this call is $1.08. 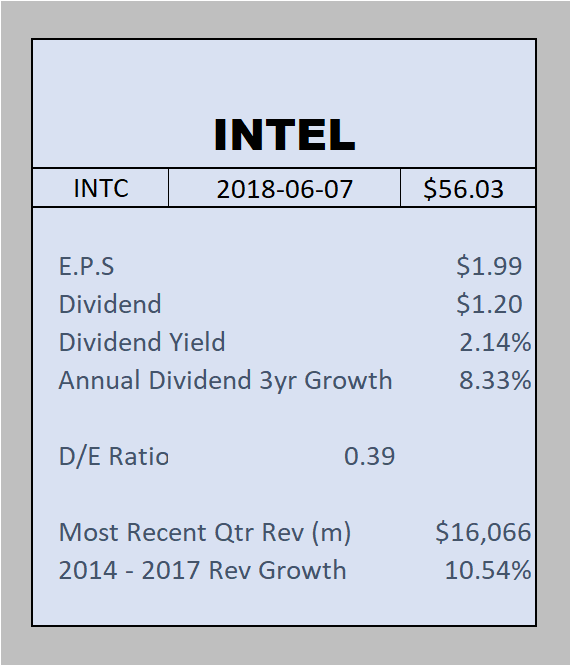 INTC's ex-dividend date is expected to be about August 4, 2018 and you should receive the dividend of $.30 provided the call is not exercised early. These are two ideas to consider. I executed all three today. I bought more CVX and INTC and sold the two CVX calls and the INTC calls. Let's see how we do.